Here we have the results from 35 recipients who took the poll. Last year, I did leave the poll open longer, and as a result in 2011 I had 104 responses. 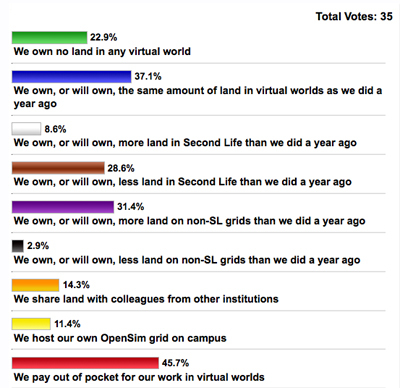 Perhaps this poll might have included the option that one respondent noted, namely "we own the same amount in SL as we did a year ago." I hesitate to draw conclusions from a small sample size of 35, for a poll advertised on two e-lists related to virtual worlds. The data suggest that more people are paying out of pocket and more people in the past year, as compared to the year before, have given up land in Second Life after the tier-discounts for education and nonprofits ended. I do not know who to interpret the "own no land" results. 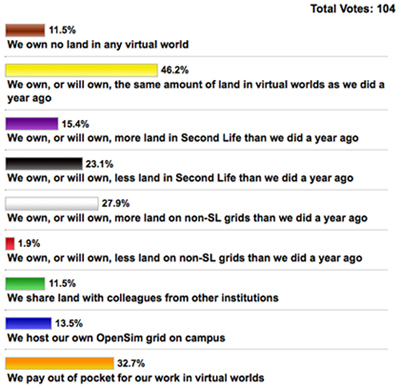 It's possible that many of the respondents are new to virtual worlds and have not made a decision. They may, in fact, be sharing parcels or islands with others, a result that is little changed from 2011. Do those remaining in SL use mainland parcels? University islands? Where are they going? To OpenSim grids? To Unity 3D and Jibe? Somewhere else? What factors most contribute to their decisions about renting server space (or hosting it locally) for a virtual world? Ballardian Fate for Virtual Spaceport?